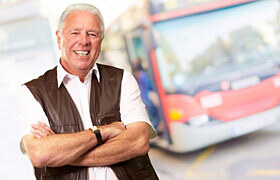 For senior citizens who’ve given up driving, public transportation can be a real life-saver. Not only are the routes convenient and timely, but many services offer reduced fares for anyone over 60 and enhanced accessibility is often available for those with limited mobility. But there are some things to consider for anyone interested in riding public transportation, especially senior citizens. Know your routes and do your research. Though you might just be trying to get to the shopping mall or the movie theater, the bus route you choose may take you through a part of town you’d rather avoid. Before committing to an outing via public transportation, look at a map to make sure the route you’ll be traveling is safe. Many are available online or your HomeHero caregiver can assist you with finding the correct route you want to take. Wait safely. At the bus stop or on the train platform, arrive with no more than five minutes to spare. Excess wait time can mean standing in a deserted public space while you wait. Bring an umbrella, even if it isn’t raining. An umbrella, especially a big one, can serve many purposes such as a pointer, cane or even weapon. It’s a good way to stake out your personal space in a crowded subway car, and let others know you mean business. * Stay alert. Keep track of stops and who is getting on and off the bus. Make sure you keep tabs on your possessions including your purse, gloves, hat, umbrella or shopping bags. This way you’ll be less likely to leave something behind when you exit. Travel with a buddy. Bring a friend, a family member or even your HomeHero caregiver along with you. Especially the first time, having a “buddy” along can help boost your confidence as you gain familiarity with the public transportation system you’ve chosen to use. Not to mention an extra pair of eyes to keep track of your belongings doesn’t hurt, either. It’s understandable that you may still want to keep your freedom by using public transportation. No matter your age, it is important to take the necessary safety precautions.